Tex-Mex food is a culinary mash-up of the fiery, comforting flavors of Mexican cuisine and the smoky, meat-centric dishes commonly associated with Texas. There’s addictive comfort found in the charred, rich cuts of meat; piquant, tangy salsas; and the creamy, salty ooze of cheese. Fantastic for the taste buds, but not always so great for the waistline. 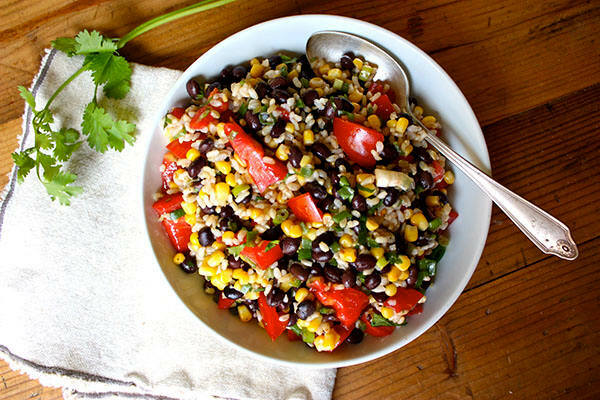 This Southwestern Rice Salad with Black Beans is a trimmed-down, fiber-filled version of a Tex-Mex rice bowl. We skipped the guac, sour cream, and shredded cheddar to bring the dish under 200 calories, but if you have calories to spare, add ¼ avocado on top. Instead of using salt and fat to flavor, we went with the verdant, fresh flavors of green onion and cilantro, added a medium-spicy kick from fresh jalapenos and chili powder, and acidic brightness from white wine vinegar. The result is a whole-grain salad that packs perfectly for a work lunch. Use leftovers to make black bean veggie burgers following this recipe for Italian Bean Burgers. Or swap out the Italian flavorings (tomato paste, herbs and Parmesan cheese) for Mexican ones like cumin, ground coriander, and even hot sauce. If you need to cut down on prep time, look for pre-cooked frozen brown rice (just make sure the ingredients list is clean); this should cut your kitchen time down to about 15 minutes. 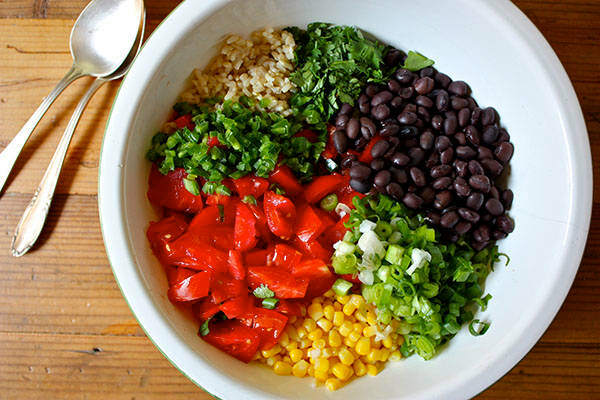 Combine rice, beans, corn, tomato, green onions, oil, vinegar, cilantro, jalapeño, and chili powder in a large serving bowl; mix well. For best flavor, cover and refrigerate for at least an hour before serving. A great FFC as part of lunch. For the vegan plan add veggies or a salad to make a great lunch.